The Bottom Line: Hands down, Brad Meltzer’s best novel. Whether in his novels or in his short-lived TV show, Decoded, Brad Meltzer has always favored using historical events as the basis for implausible but entertaining conspiracy thrillers. 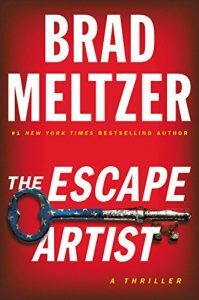 In The Escape Artist, Meltzer demonstrates that he can also invent a truly magnificent character that, in virtually all ways, is better than the real-life characters he often uses as the basis for his tales. In The Escape Artist, Nola, a U.S. Army artist-in-residence, likes to put herself in the throes of battle in order to produce paintings that reveal truly unique observations about combat. But on her last mission, Nola saw something nobody was supposed to see, earning her an enemy unlike any other, one who will do whatever it takes to keep Nola quiet. Her body is found on a plane that mysteriously fell from the sky as it left a secret military base in the Alaskan wilderness. Her commanding officer verifies she’s dead. The US government confirms it. But Jim “Zig” Zigarowski has just found out the truth: Nola is still alive. And on the run. Together, Nola and Zig will either reveal a sleight of hand being played at the highest levels of power or die trying to uncover the US Army’s most mysterious secret-a centuries-old conspiracy that traces back through history to the greatest escape artist of all: Harry Houdini. Meltzer manages to keep the story moving while building two incredibly compelling characters. If you’re looking for a book so good that it will keep you up all night, The Escape Artist is an adventure well worth taking.